The above is essentially the multi-variable chain rule. If you're me, and you can get to this step, the rest is pretty easy. One thing to notice here. As physicists, we're often fond of 'cancelling' differentials like fractions, (as a memory aid if for not other reason). Our mathematician buddies frequently caution us that this is just wrong. If you 'cancel' the partial x or partial y differentials above and add, you'll see an example of why you have to be careful with this. Since we're looking for the Laplacian which involves second derivatives, have faith, press on, and apply 'partial partial u' and 'partial partial v' to the above equations once more. Next, add the results together (picture 4). Here's what we're up to. We want a Laplacian that we can apply to scalar fields in the parabolic cylindrical coordinate system. 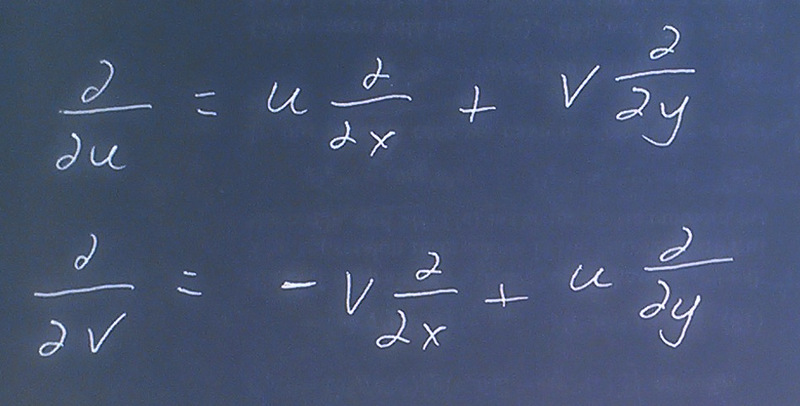 If you look at the last set of results above, you'll notice that all the u and v differentials are bound up behind other differential operators. That won't do. We need to be able in the end to be able to apply them directly to functions written in the u, v system. 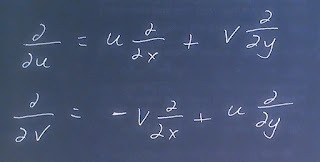 So, we collect our blind faith again and apply 'partial partial u' and 'partial partial v' calculated in step two to the x and y differentials. After that, all that remains is to collect like terms and make the whole mess look like a Laplacian. The z term gets tacked on a the end since it was orthogonal to the other two coordinates in each system and had not u or v dependence. Hopefully, there will be more on this later.